Hi all! I am so excited for today! 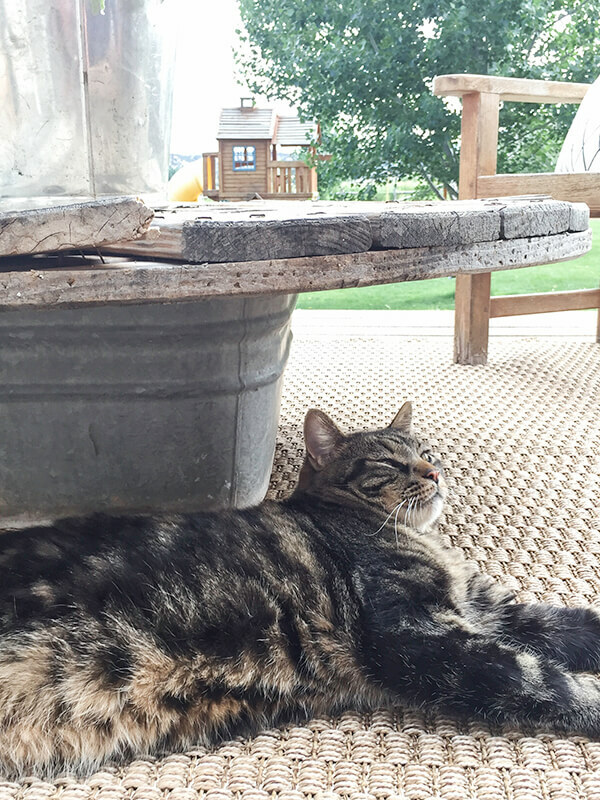 Today is my day to give you a little tour of one of my favorite spaces ever, my outdoor spaces. 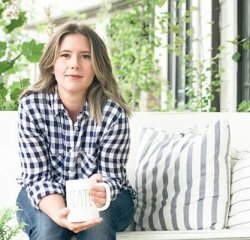 I have teamed up with some really amazing friends for a summer garden tour and outdoor spaces bloghop. My farmhouse outdoor garden tour starts NOW. From about the 1st of May, working in our outdoor spaces is just about all we do. Every year, we plan and prepare our garden, being very thoughtful about space planning as well as creating a functional and beautiful space. 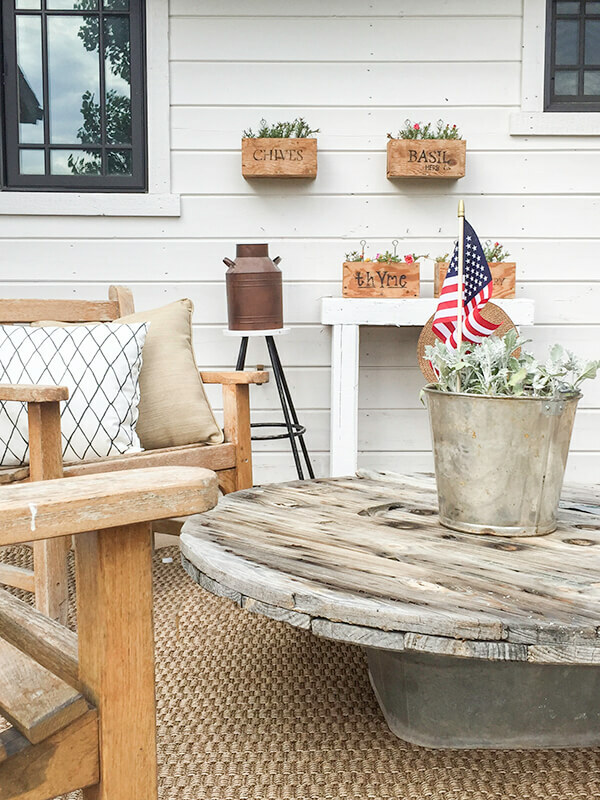 Each and every space outdoors has its own character and special touches to bring an inviting feeling to anyone who may be stopping by. As you stumble upon my front porch you can see our large flower beds that flank it. The green grass and the inviting walkway entice you to come stop by. 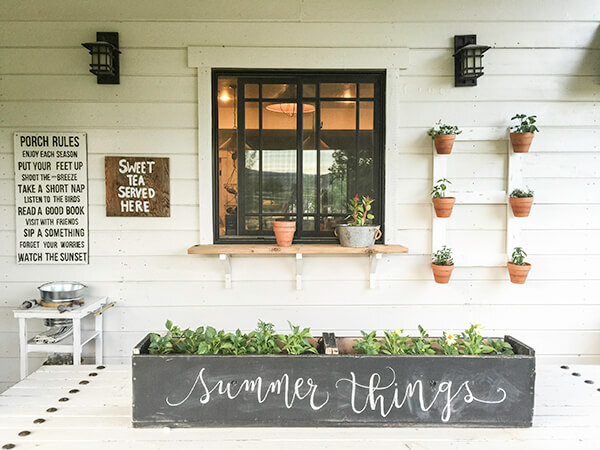 The rustic wood beams of the front porch along with my large pallet planters add that charm and character that I was striving for. My goal in the interior as well as the exterior is to create a space that is timeless. A space that feels like it has been a farmhouse for 100 years. I always have a set of mud boots on the ready, since I spend more time dirty than clean through the summer months. My front porch is my absolute favorite place to relax. 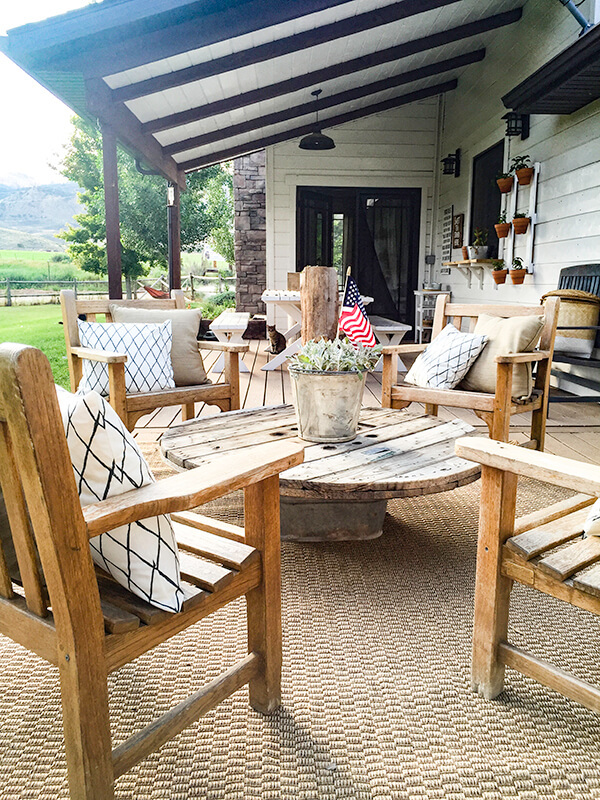 Our antique glider turned swing is an awesome place to enjoy the evenings. I think one phrase that can personify my style is perfectly imperfect. I am okay with things being a little imperfect. It adds character, it adds a real human touch. As you head toward my backyard, you can see the rock wall that my husbans has built out of found stones that we pulled out of their farm. Slowly, he plans to fence in the entire front yard. I cannot wait. The entrance to our backyard is bordered by the fence and gate that my husband and I built ourselves. 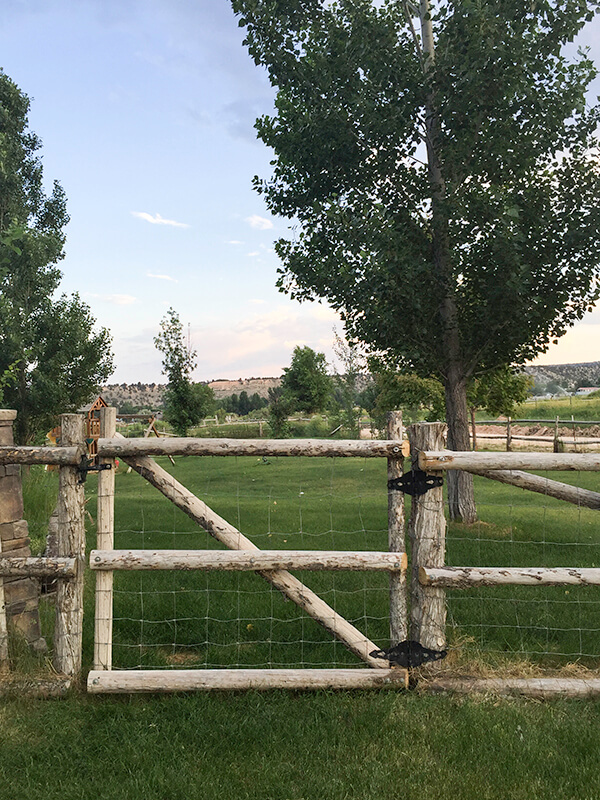 We spend the majority of a summer fencing in our backyard with raw pine poles and cedar posts. I can build fence with the best of them. Perfectly imperfect. My backyard is my escape. We spend so many hours out here, I would consider sleeping out here if I weren’t so afraid of the dark. Every year we grow a rather large vegetable garden with tomatoes, corn, onions, broccoli, cucumbers, summer squash, beans, peas, lettuce, kale, and our favorite…pumpkins. We have four peach trees and one apple tree and this year, after about 4 years, we finally have fruit again! At the entrance of the garden my husband built a grape arbor that also has our first year of grapes on it. We cannot wait to taste those concord grapes. 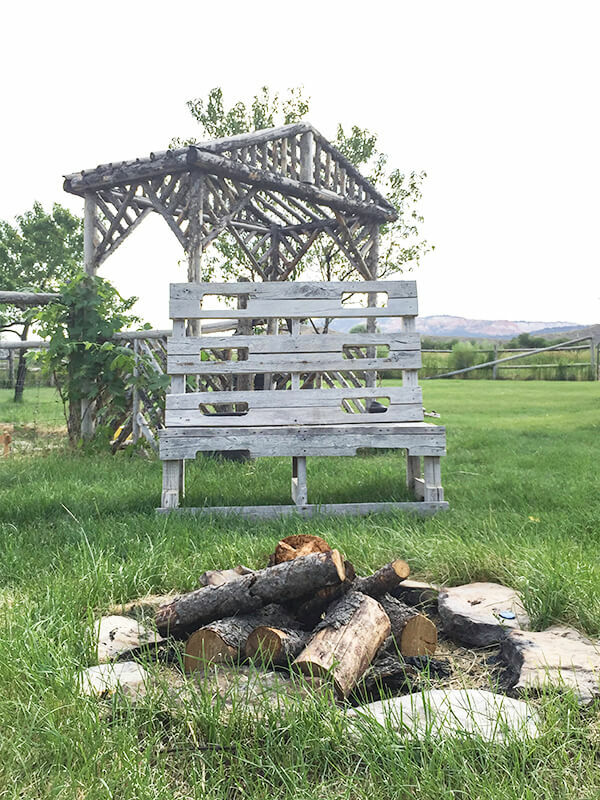 Near the garden is our simple and easy firepit made from found stones. We use this pit many times a week, usually with some scary stories being told. 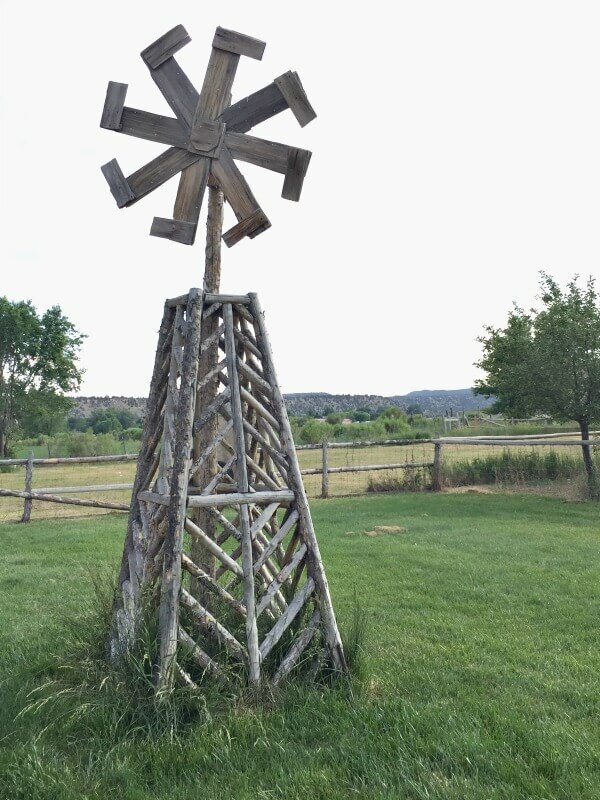 One of my favorite features in my backyard is the windmill that my hubby built one weekend while I was away on a girls trip. I never even thought to ask for a windmill, but he apparently thought it was completely necessary, and who am I to argue. I have to brag at his resourcefulness. He build the windmill around an old wheel from a broken lawn mower. A man after my own re-purposed heart. The last space I want to show you is my back patio. We have created another outdoor oasis here. We spend most nights eating dinner here. 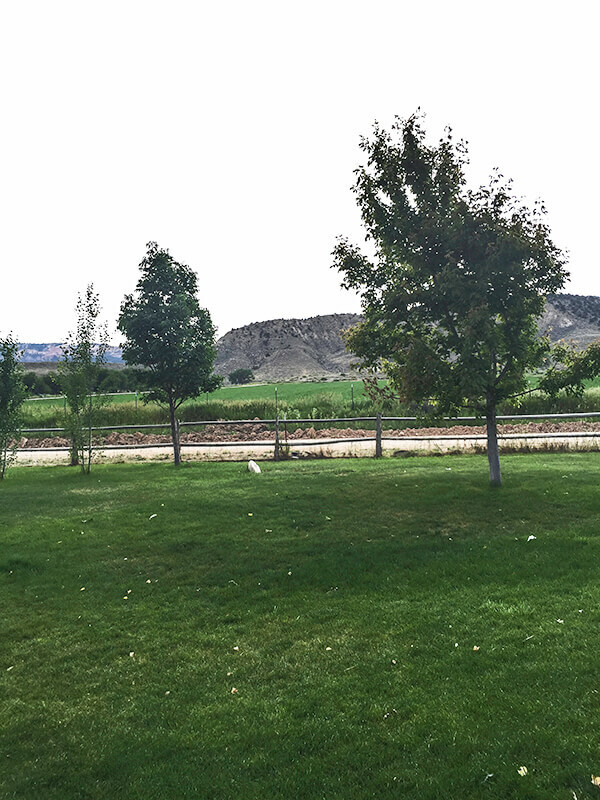 From this spot, you can see all the hay fields that our home is surrounded by. 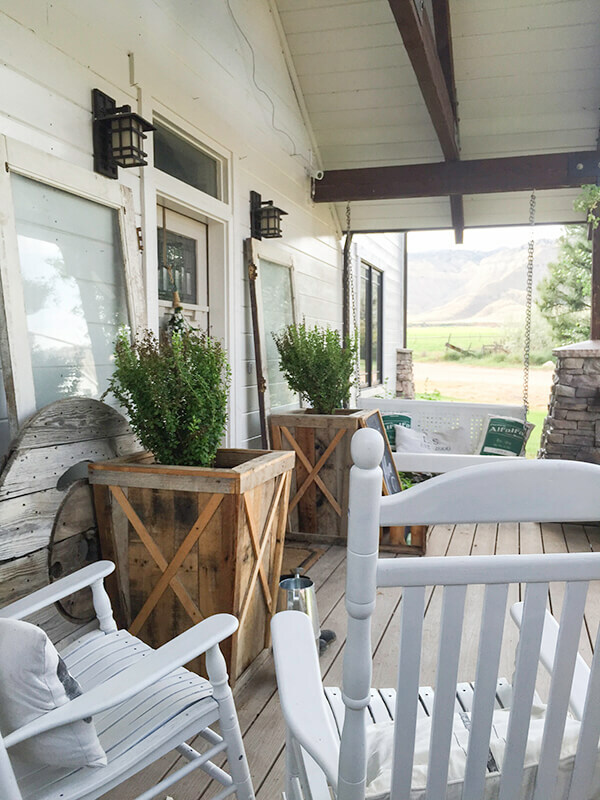 There is nothing more relaxing than sitting on this porch and watch the long wheel line sprinklers spray water into the air, creating a dreamy silhouette. One quick note about this picture: I have been so crazy busy helping my sister get ready for her wedding this weekend that is taking place a few minutes from my house on some of our companies private property. As I was running around frazzled, I asked her to draw something on my chalkboard planter. She asked me what I wanted it to say, and I said “you know, summery things”. Well, that is what I got. Talk about creative. 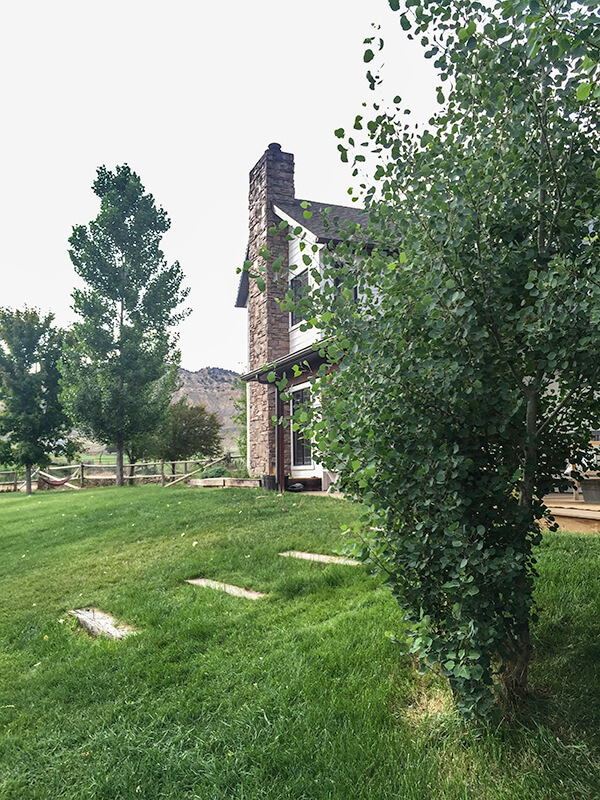 We are obsessed with our Quaking Aspen trees that we have planted throughout our yard. Believe it or not, none of these trees existed when we bought the property. It was empty. We have since planted over 50 trees and in just a few years, they have thrived and grown. 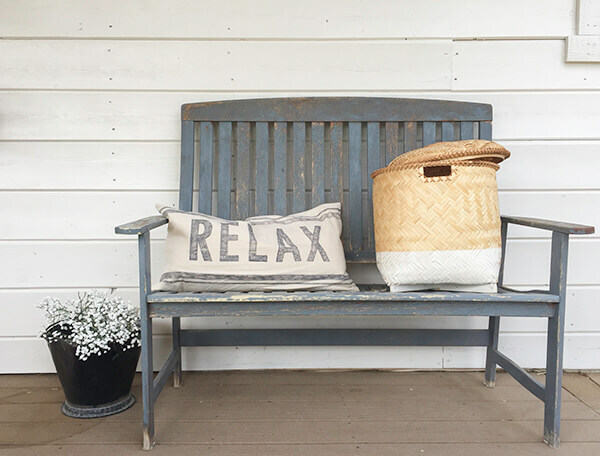 I am inspired by calming farmhouse porch decor here. I created different areas by grouping furniture together. I created a nice conversation space with 4 reclaimed solid teak wood chairs. 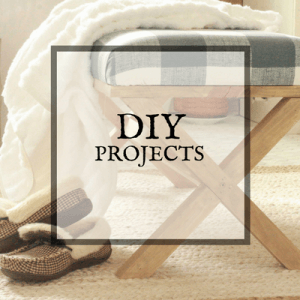 All I needed to do was add a wire spool round on top of a galvanized bucket to build a coffee table that can also be used as a table you can eat at. 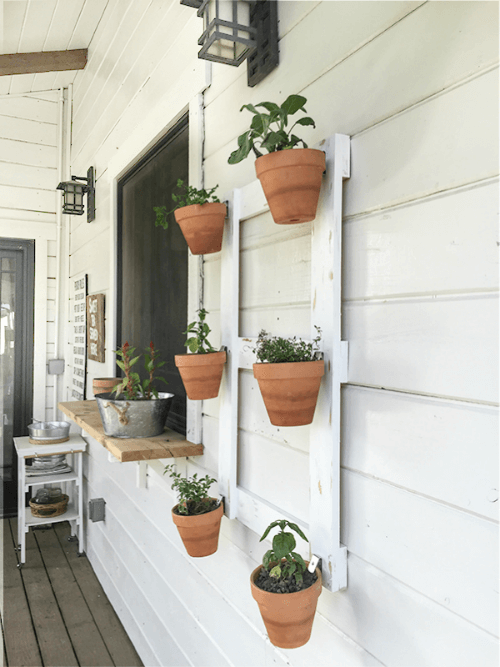 I hung my DIY hanging planters boxes to create some interest. Even my cat cannot complain. He also wouldn’t cooperate. Every time I tried to shoo him away so I could take pictures, he would sneak in wherever I was. 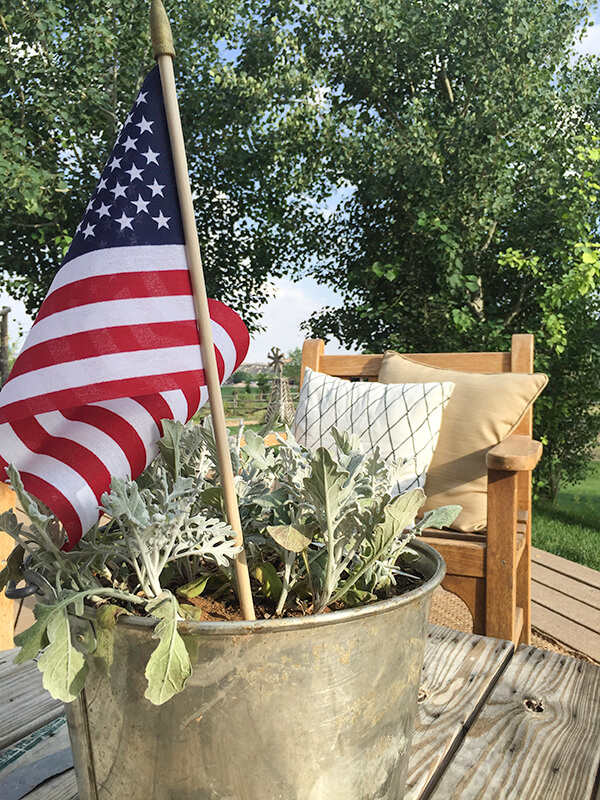 What I love about my farmhouse outdoor garden tour? I love the ease and simplicity. 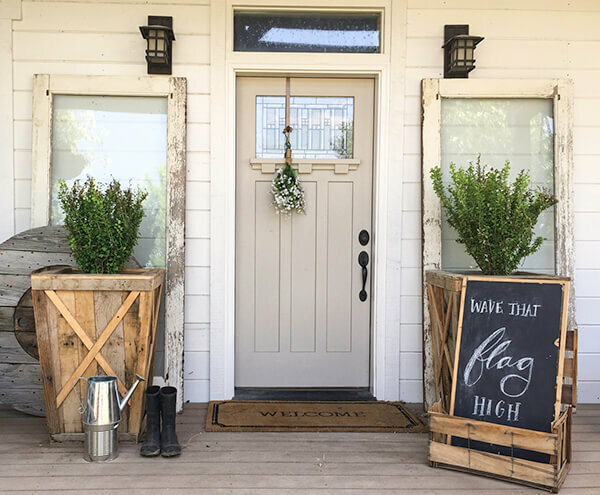 Creating a farmhouse style porch is takes minimal effort, since using found objects are a large element that is implemented in the decor. 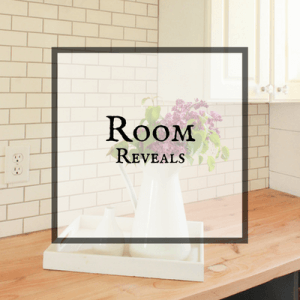 I find it harder to keep it clean now that summer has started and I have 4 rambunctious kids at home, but that just comes with the territory, right? 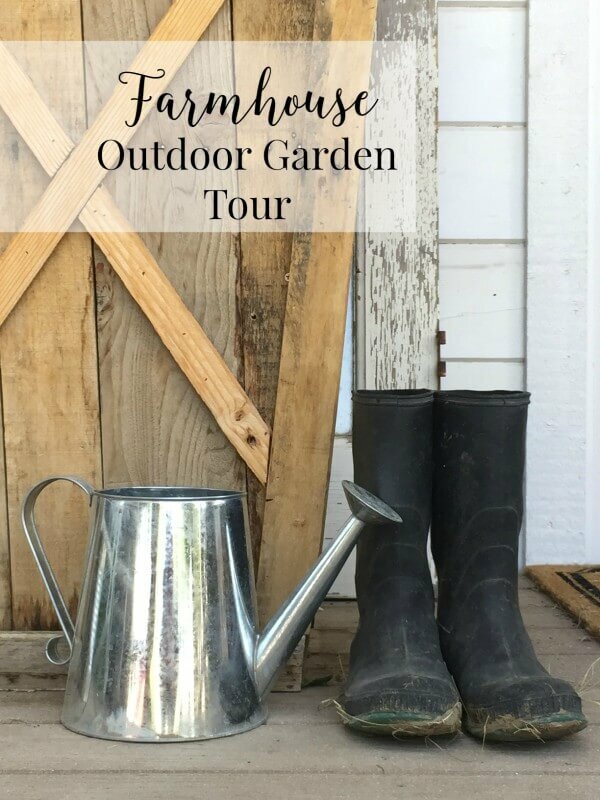 I hope you have enjoyed this farmhouse outdoor garden tour. You really aught to stop by and check out some of the other talented bloggers. You can find their links below. Thanks for stopping by! 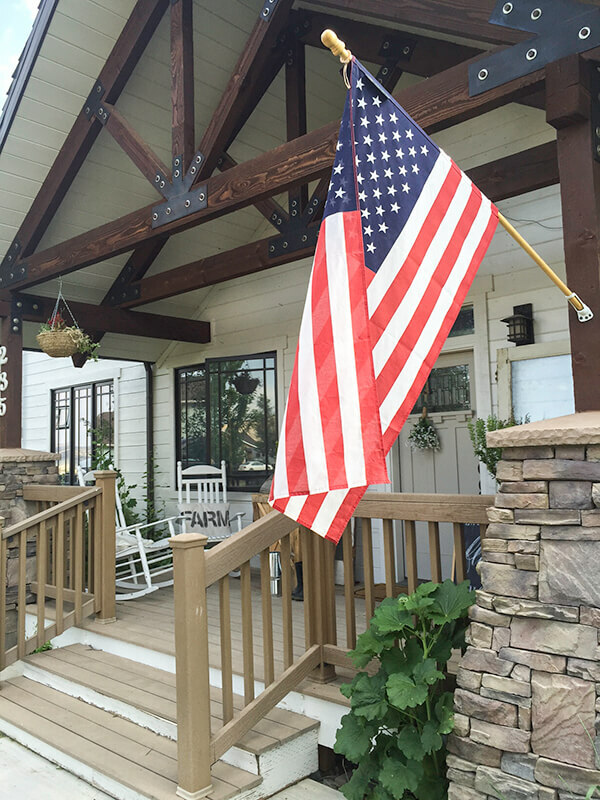 Sara, your home is simply beautiful and so full of character! How awesome is it that your husband builds so many cool things? Everything looks so cohesive in your home, both outside and inside. Enjoy these summer days! Thanks Tee, you are so sweet to say that! We love living where we live! Your garden area with the grape arbor, fruit trees, and fire pit, along with all those veggies, is just what I imagine for our garden area in the back part of our yard. 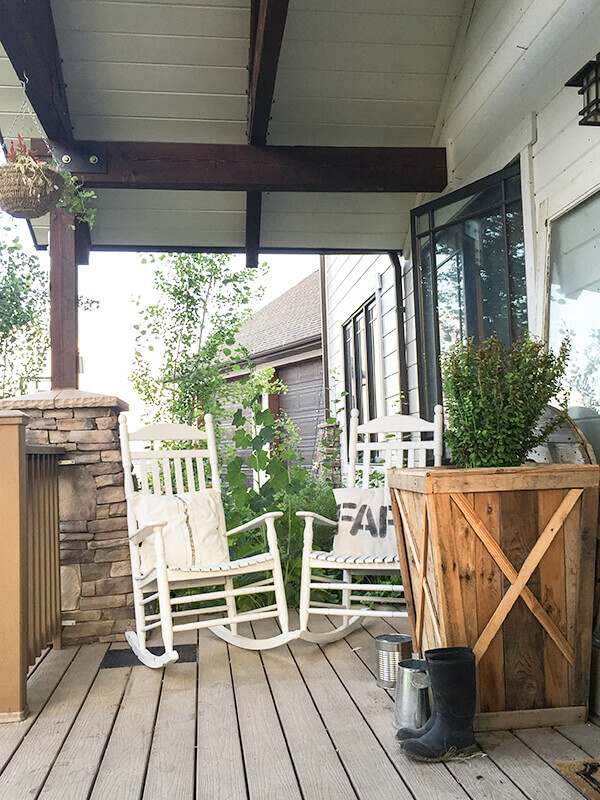 Thanks for all the inspiration – I love what you’ve done with your front and back porches, too! Thank you jenny! It is our favorite place to be. 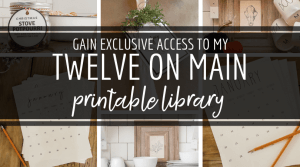 This is insane – in the best way possible! I cannot believe how gorgeous your outdoor spaces are! I am so glad you shared them as part of this tour! Sara, what an amazing property! The windmill your husband built is awesome. 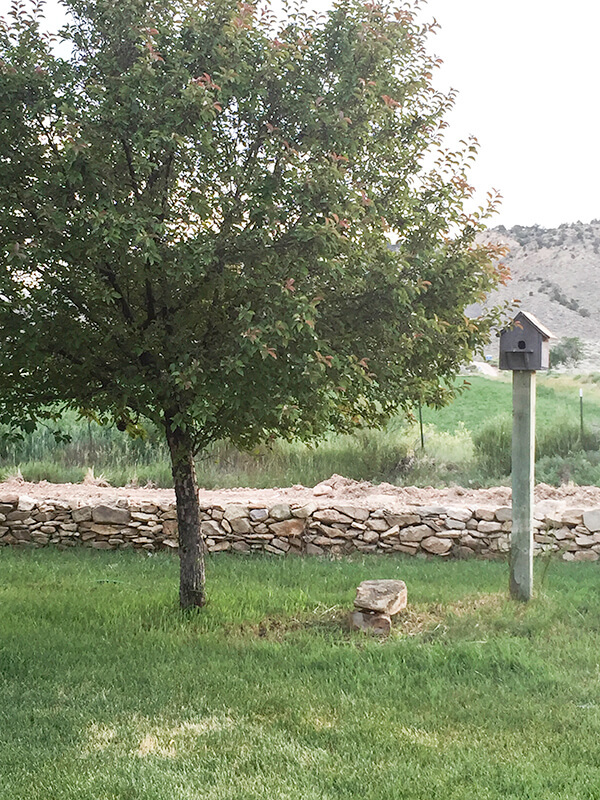 We have a quaking Aspen here too and it’s so fun to see even the tiniest breeze makes the whole tree come alive. Your back patio looks so cozy and perfect!!! That coffee table seating area you made is genius! Thanks Tara! I love our property! We really are lucky! This is gorgeous! Your porch is beautiful!!! What a beautiful place to relax and unwind. It was fun touring with you this week! Wow! I don’t even know what to comment on because it’s ALL so amazing! 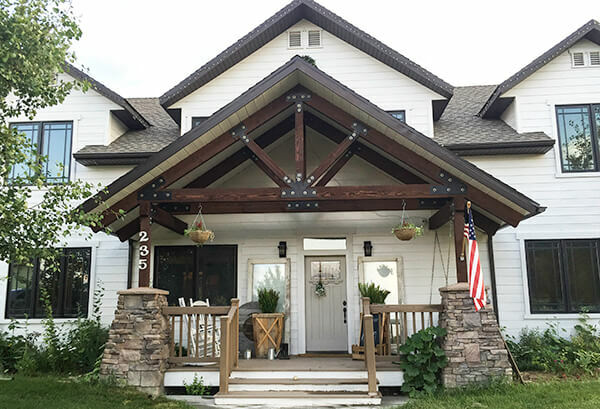 Your front porch with those beams is beyond gorgeous, love that farmhouse fencing, and the view of the hills is dreamy! Roxanne, I thunk sometimes it is easy to forget how lucky I am to live where I do, and doing this garden tour was a wonderful way to remind me. Thanks so much for your sweet words. You’ve got a great outside space! Love all these pictures!! Sara, loved everything about your outdoor tour so can’t just comment on one thing!!!! So wonderfully inviting and interesting! Love the outdoors myself! Thanks for sharing. 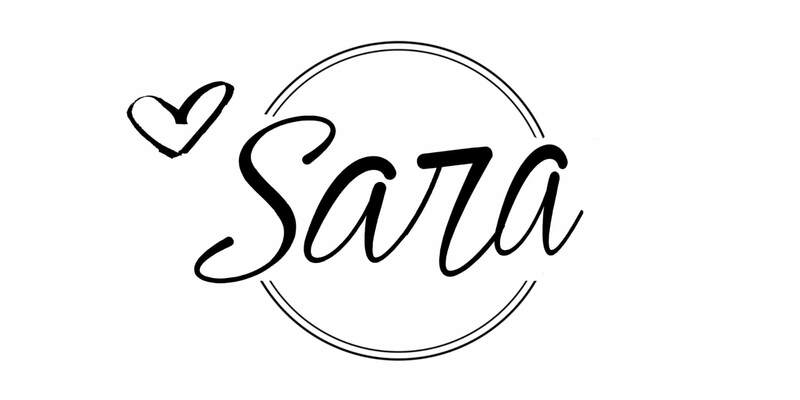 Sara – you have blown us away! You and your husband are absolutely industrious and unbelievably creative! The windmill is super cute and charming. We love your outdoor table too! Fantastic tour! Thank you Vicki and Jennifer! Your words are so sweet! Have a great day! Your home is gorgeous! 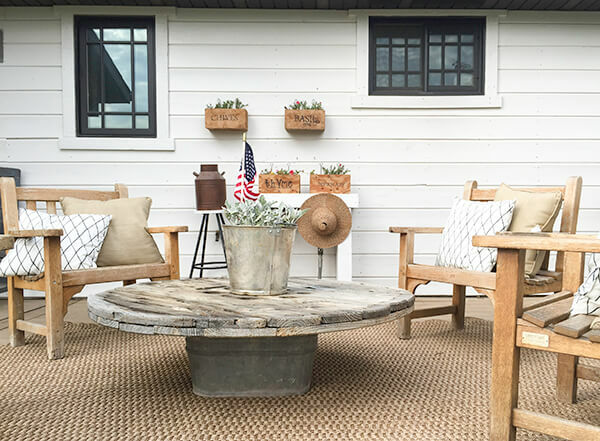 I love the outdoor space and that windmill is TDF! Thank you Erlene! The windmill was something I never thought I wanted! Your home and property are so incredibly beautiful — I would never want to leave! Everything looks so perfect. Enjoy your summer! Thank you Lauren! It is true that I never want to leave! I love it all! The view is amazing! And that windmill is awesome and SO sweet!!! That looks wonderful! So quaint and homey! Your outdoor space is wonderful!! I love the coffee table and the herb garden – and the whole thing! What a great place to relax and enjoy the summer weather! I’ve stumbled across your webpage and so glad I did. Feeling inspired by your creativeness and charming home. I’m especially in love with those large pallet planters. Do you have a tutorial for those? Hi there. You’re garden tour is so great. I would love to find out where you found those white/diamond pillows. Hope they are still available. Your outside areas are so inviting. I really like your DIY planter boxes on the exterior off your home. And the “summery things” planter box is wonderful. Such a beautiful yard too.